I occasionally have the opportunity to import comics from around the world. Generally I’ve had more success with cartoonists and shops based in Europe, but I recently got a few new books from South Korea, which is a first. One of the comics I was immediately drawn to was from the SSE Project. The SSE Project is an online gallery and publisher that creates zines of the exhibited works. 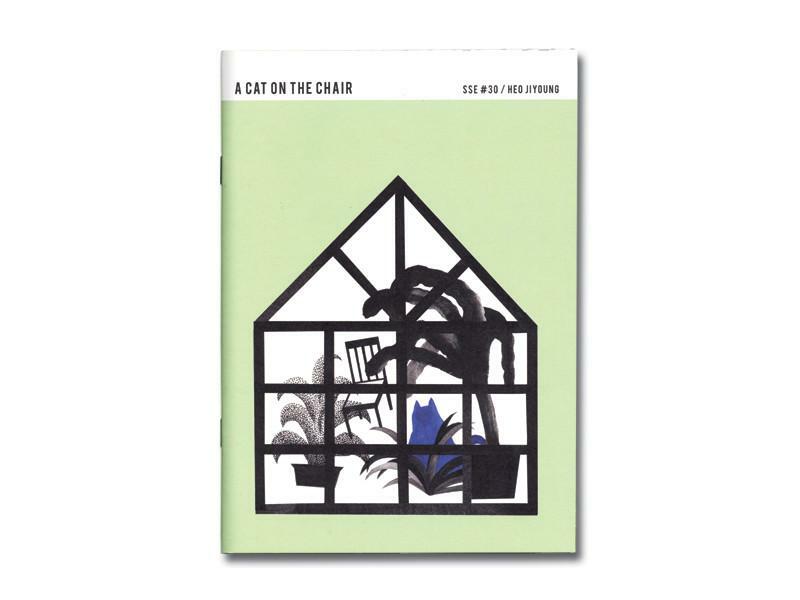 A Cat on the Chair by Heo Jiyoung is the SSE Project’s 30th exhibition. 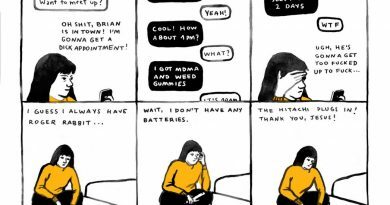 Recent SSE Project-exhibited cartoonists include rising star Tara Booth; her name initially drew me to the project, and then some browsing did the rest. 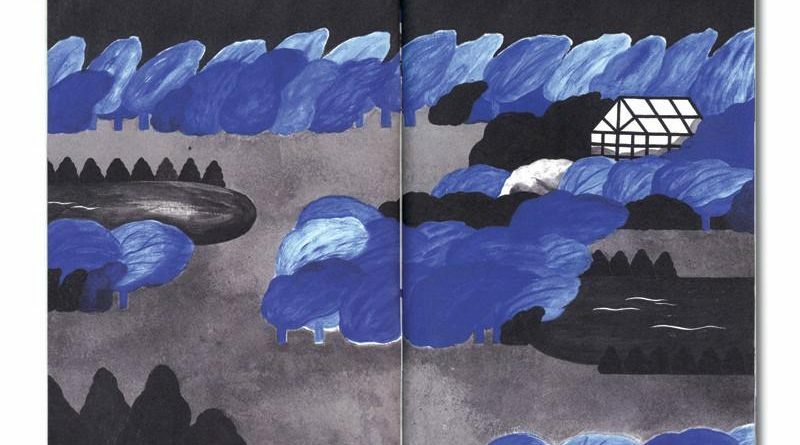 Heo Jiyoung’s work is painterly, black and white wordless illustrations with blue accents. 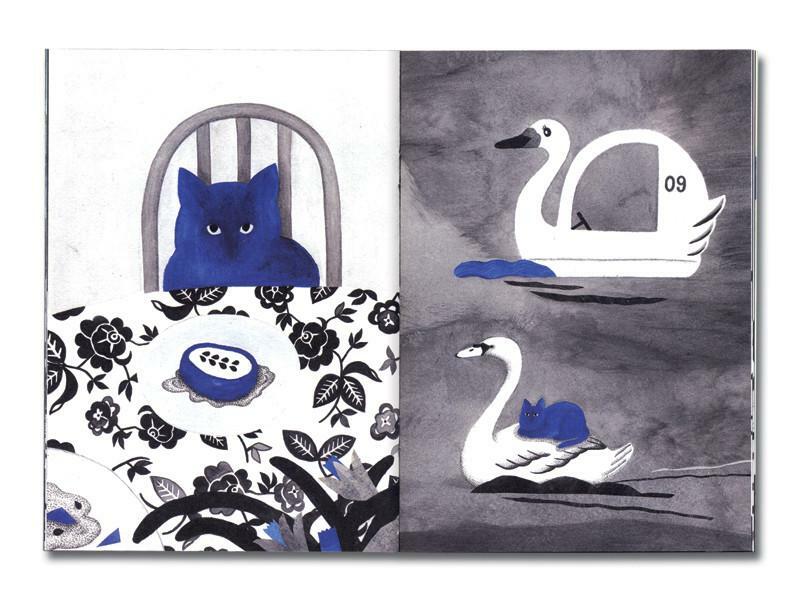 The eponymous cat appears early on in the book, blue against a backdrop of black. The blue tone, a prominent feature on all the pages, is deep and rich. 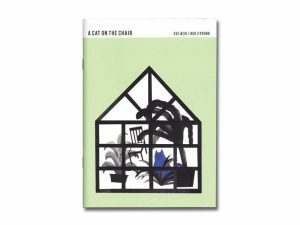 As the narrator steals the cat away from its space in a greenhouse and brings it into their home, the space between reality and the pictured world seems to break apart. 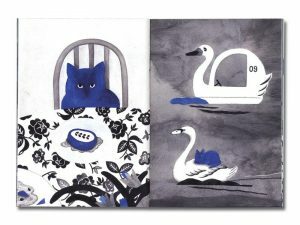 Like other abstract comics, A Cat on the Chair is initially resistant to interpretation, but the core of the comic’s expression lies in how Heo Jiyoung uses the color blue and the cat. As a pet, cats are often more independent and indifferent to human affection than other domesticated animals.The cat in A Cat on the Chair follows that pattern. While it certainly exists and isn’t actively aggressive to the person in the comics, neither is it affectionate. In some ways the cat acts as a mediating force, a symbol upon which other things can be built. The cat’s striking gaze, peering out of the blob of blue paint that makes up its body, observes its kidnapper. Its vision is penetrating and fierce. Under that gaze, the human character appears miserable, shrinking away from the physical presence of the animal. There’s also something very dreamlike about the ending of A Cat on the Chair. 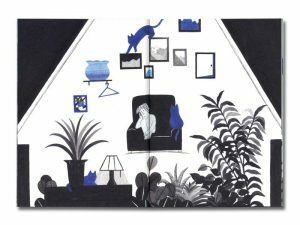 We see silhouettes of the animal in question appear in picture frames, an implied disappearance and a resumption of the cat’s occupancy at its previous location, a distant greenhouse. This movement, with its complexity and strangeness, emphasizes the metaphorical aspect of the cat and the work itself. It would be easy to label the cat as a metaphor for depression. The links are all clearly there; the cat’s distance, its gaze, its deep blue color. But more appropriately I think the cat is a stand in for a more holistic emotional complex. A mix, perhaps, of mourning or loss. Clearly coveted but unable to be contained, the cat may also represent a deep sense of longing or a nostalgia for the past. 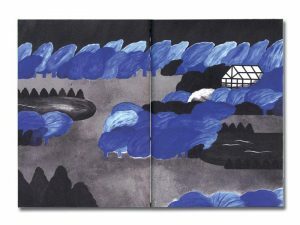 Likewise, the color blue, often associated with depressed mood, seems more associated with a sense of space and a sense of enveloping stillness than it does one specific emotion. The complexity of the overlay between what is real and what is not, as well as A Cat on the Chair‘s dense symbolism, makes it appealing. 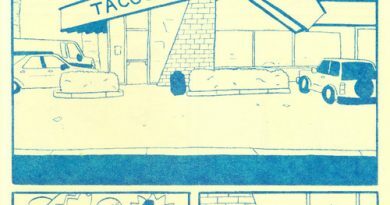 And there’s also a sparseness to this zine. In a way, Heo Jiyoung gives the reader space, letting them into the house portrayed. The other-worldliness of the book is its most compelling feature, and a fine introduction to the series.